CANOPY—A RAINFOREST ODYSSEY premiered November 20, 2010 at Stepping Stones Museum, Norwalk, CT. In celebration of the Museum's 10th anniversary and grand re-opening, following a 22,000 square foot expansion, Stepping Stones commissioned Eaves to write, design and perform a play about world rainforests that would fully utilize the Museum's newly opened State-of-the-art Multimedia gallery and also honor the Museum's philosophy of inquiry-based learning through play. Eaves responded with CANOPY—A RAINFOREST ODYSSEY, an adventure-filled journey of an extraordinary leaf, hidden deep within a rainforest. Performed on a stage illuminated by 35' by 12' projected animations and immersed in a 5.1 surround soundscape, CANOPY—A RAINFOREST ODYSSEY continued Eaves' theatrical design and construction of performative works that are lit by projected animations. 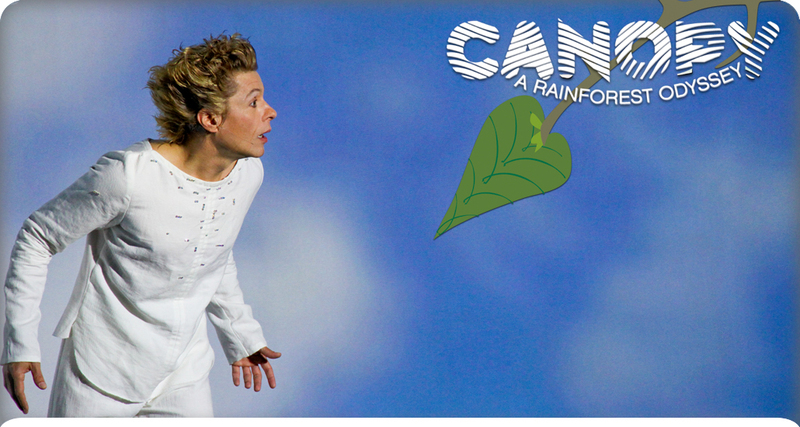 CANOPY—A Rainforest Odyssey played to audiences of all ages who delighted in the interactivity of light and sound, song and dance and earnest storytelling. Written, designed and performed by Christopher Eaves. Choreography by Matthew Mohr. Original music by Sarah Lynch. Wardrobe by Natalia Baca. Produced by eavesdrop. As Stepping Stones Museum's 2010 artist in residence Eaves also designed and facilitated Community Voice & The Art of Play, a year-long professional development series for the Stepping Stones Museum staff.